Copy version is a service that allow project maintainers to create new project version by branching off existing version in the same project. This saves project maintainer from uploading the same source and translation documents every time a new version is required. 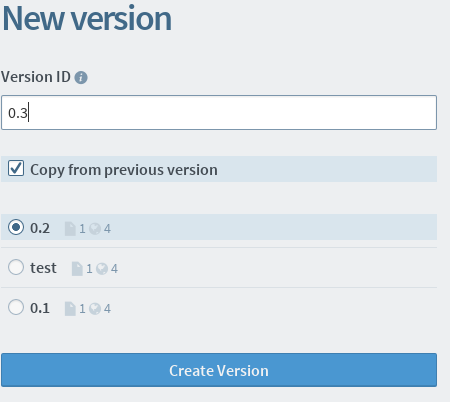 When creating new version, project maintainer can select if it will be copying from an existing version in the same project. Select option Copy from previous version. Select the version you wish to copy from. In the screen shot below, this will create a new version 0.3 and copying all information and history from version 0.2. A progress bar on the version page will displays the progress of the operation. Go to Version tab in your project page. 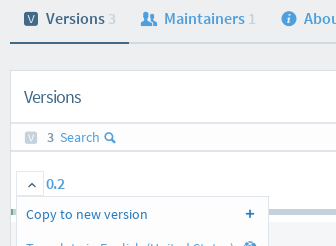 Locate the version you wish to branch off, click on the menu in front of the version and select Copy to new version. The same menu can access by going to the version page, and click on More action menu on the top right. Select Copy to new version. This will redirect you to Create a new version with pre-selected version. Fill in new version id and click Create Version to start.